Ingrid Marie apples make the base of the balsamic reduction and are complemented by a little blackcurrant juice. 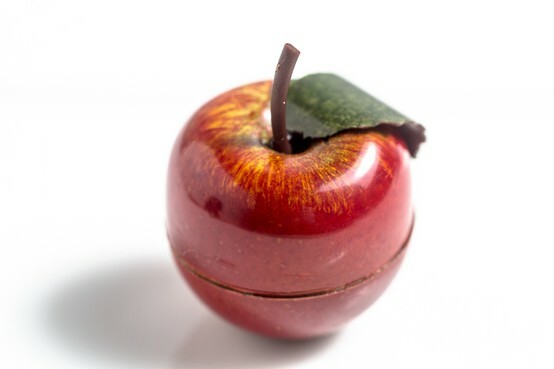 A ganache on the fruity Mexique chocolate infused with blackcurrant buds, which draw your thoughts towards blooming flowers, accompanied by crunchy cocoa nibs, and altogether encapsulated in a thin shell of intense Venezuela chocolate. Bring the cream, invert sugar and blackcurrant buds to a boil. Blend with hand mixer and strain over chocolate. Incorporate butter at 40°C. Pipe in to moulds at 32°C. Make small dots with the light brown cocoa butter. Spray the mould with red cocoa butter, remove the pvc and spray with green cocoa butter. Make the shell with Cacao Barry® 72% Venezuela chocolate added 10 % cocoa butter. Pipe the balsamic reduction into the mould. Fill in cocoa nibs. Pipe the ganache into the mould. Scrape off the excess ganache and sprinkle with finely ground cocoa nibs. Decorate with chocolate decoration.